1. The galley as it was. 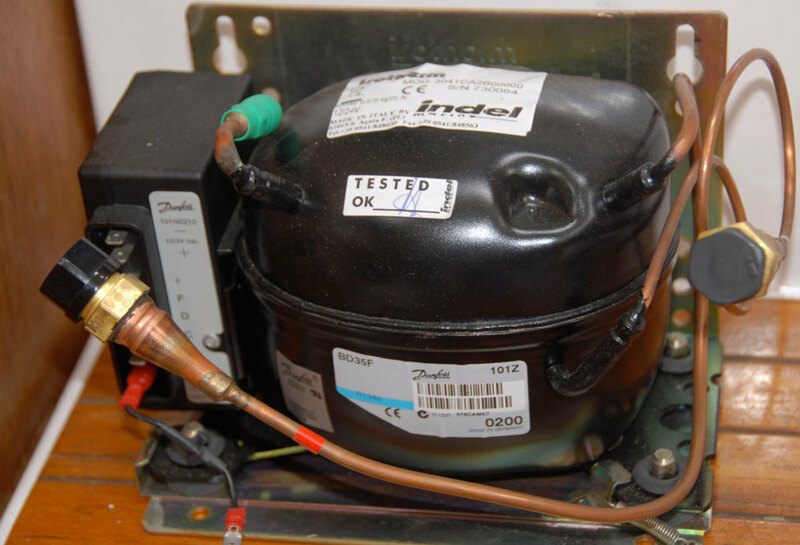 Inset: here’s the original coolbox—insulation? 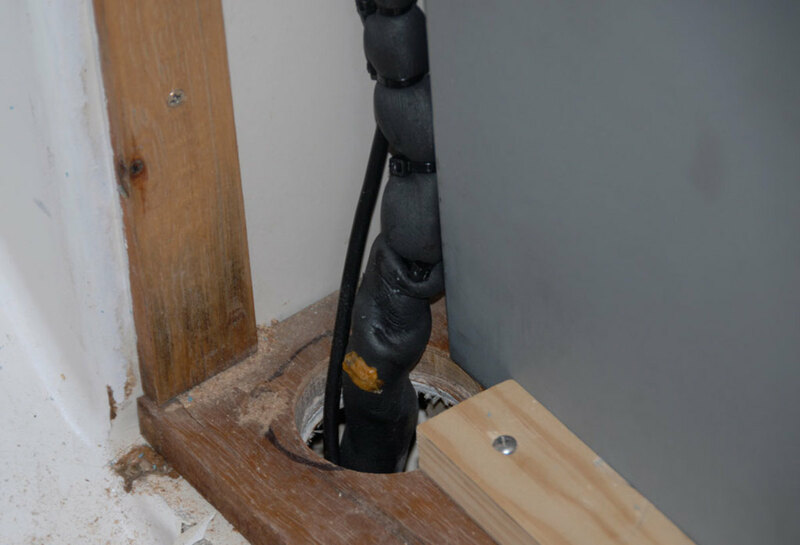 What insulation? The coolbox on our Norlin 34 was scarcely worthy of the name. You could almost watch the ice melt inside it, and if we wanted to be sure of cold drinks on our weekend cruises we had to tote a cooler aboard. 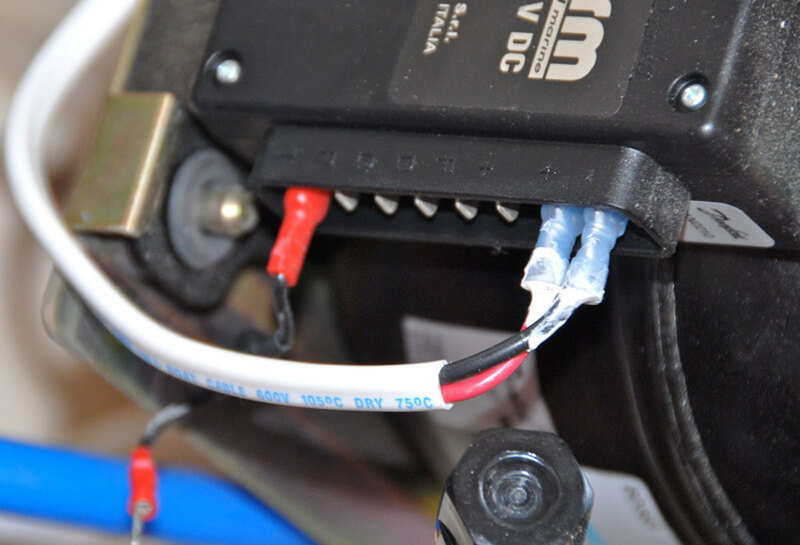 I’d long played with the idea of adding more insulation to the box and retro-fitting a 12-volt refrigeration unit to it, but when I sat down and worked out what was involved in such a project—and how long it would take—I quickly started thinking about other options. 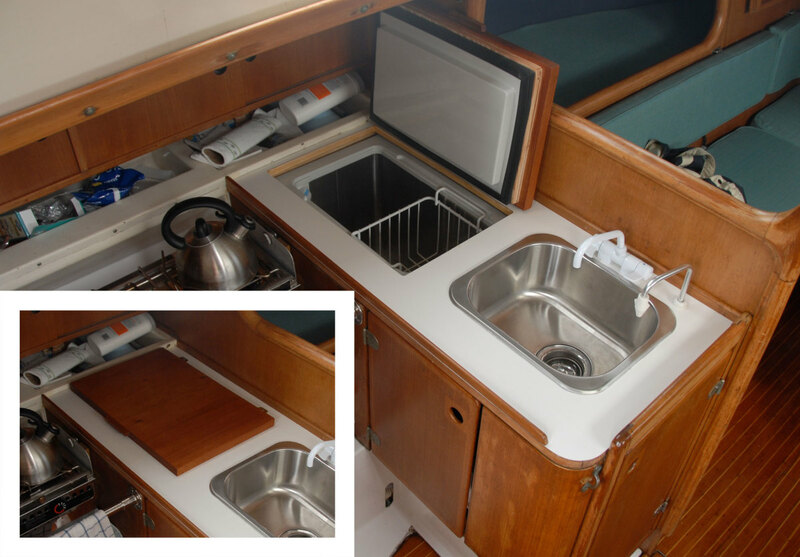 [advertisement]More and more new production boats are appearing with drop-in or slot-in, self-contained fridge/freezer units—much like the small bar fridge I have in my office. Why shouldn’t I install one of those? The promised ease of installation appealed to my innate laziness. Some quick research unearthed more options than I would have thought possible. I could buy a portable 12-volt fridge in any one of a number of sizes, and stash it under a bunk. I could have an icemaker, or a front-opening fridge or one with pullout drawers. 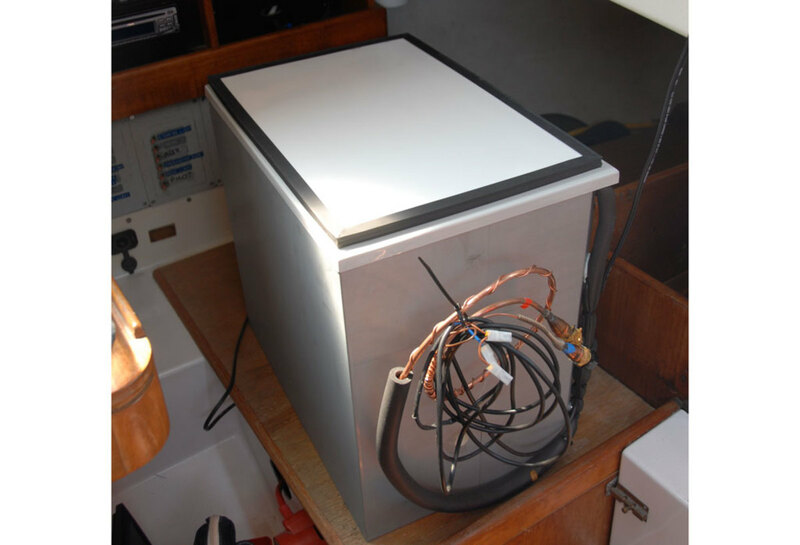 Or I could install a good old-fashioned top-opening coolbox with an evaporator or cold plate, either with an integral compressor or one that could be installed remotely. 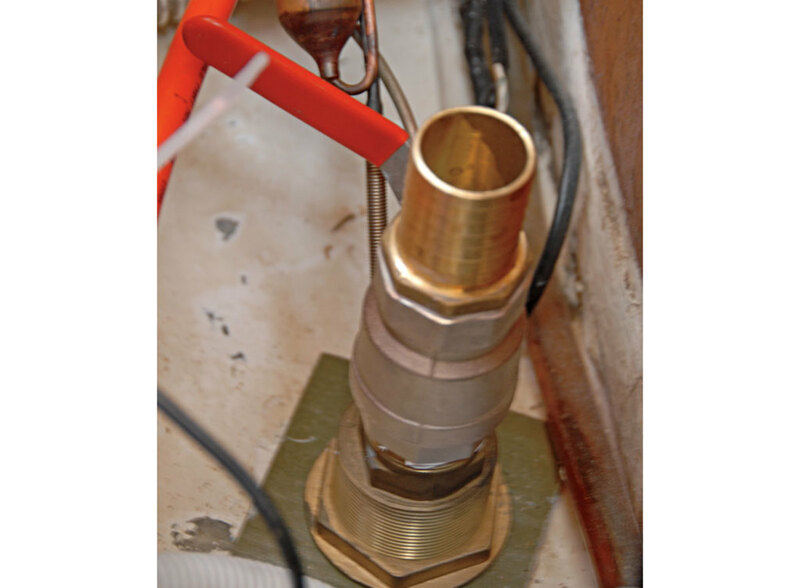 I had plenty of room under the galley island for a compressor, so this plan began to sound sensible. 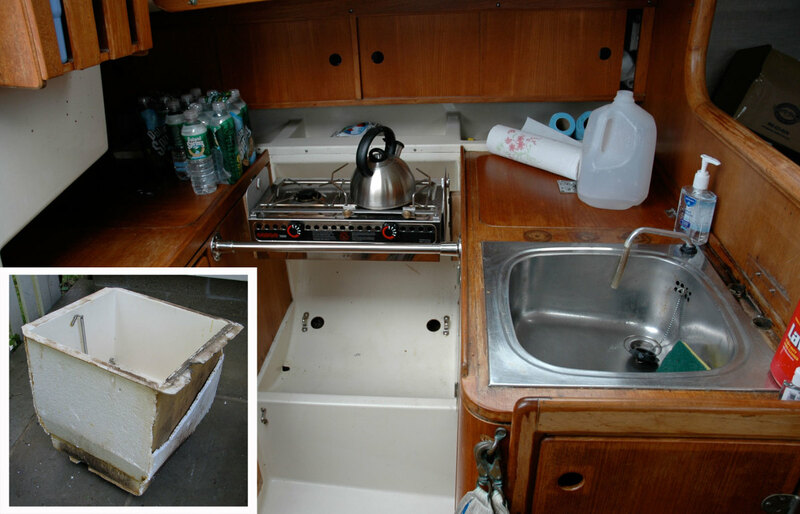 The first step was to remove the galley countertop and existing coolbox so I could determine how much room I had to play with. 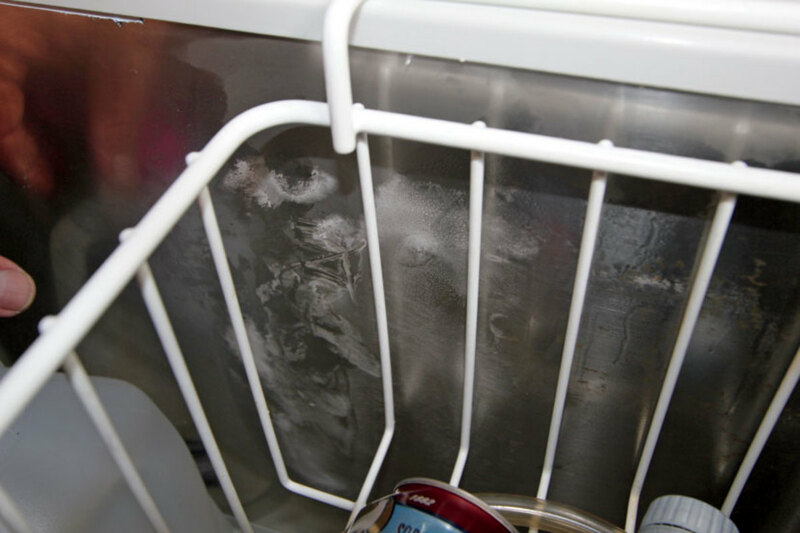 That coolbox had less than half an inch of cork “insulation”—no wonder it wouldn’t keep ice! I found the sink was rusted out around its fixings, so decided to replace that also—which would mean making a new countertop. After taking the relevant measurements, I spent a couple of hours with my old friend Google, researching my options. It didn’t take long to narrow them down. Measuring 24.6in x 13.4in x 19.7in, Indel Marine’s Isotherm BI 41 build-in coolbox fitted the available space almost perfectly; with a capacity of 1.5 cubic feet it would be plenty adequate for weekending and coastal cruising, and it was made of stainless steel both inside and out (not true of all makers), with the evaporator concealed in the wall of the box. 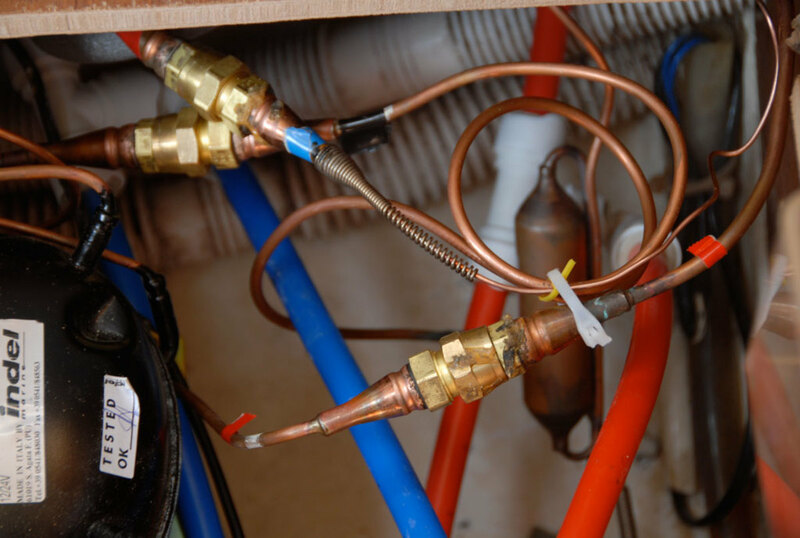 It came with a trusty Danfoss BD35 compressor (common to most marine refrigeration systems) that could be installed up to six feet away. 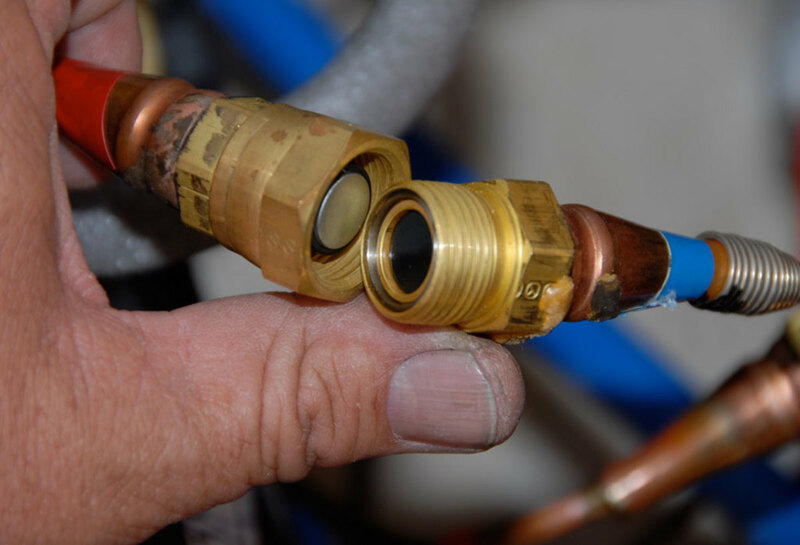 With quick-connect fittings on the piping so that even a ham-fisted type like me could hook compressor to evaporator without wasting the refrigerant, it looked like an easy DIY project. 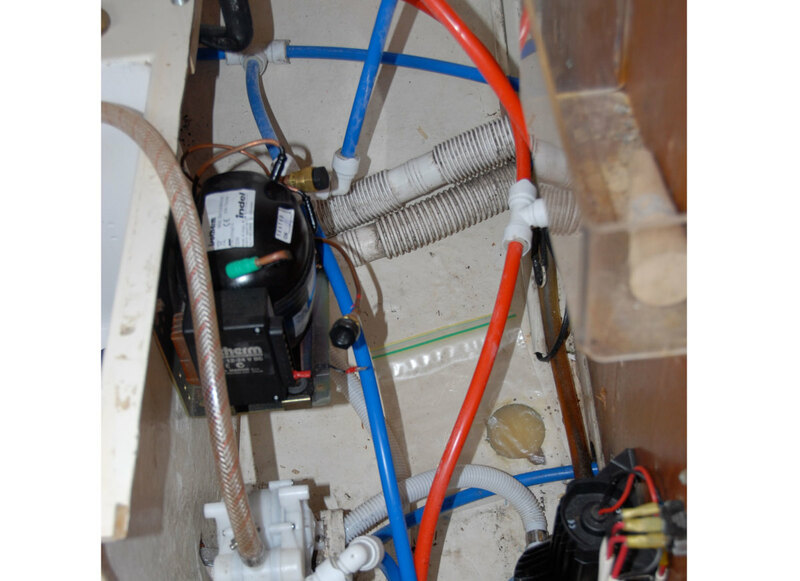 However, after consulting SAIL’s systems guru, Nigel Calder, I decided to add an extra layer of complexity by specifying Isotherm’s SP (Self Pumping) watercooling system. 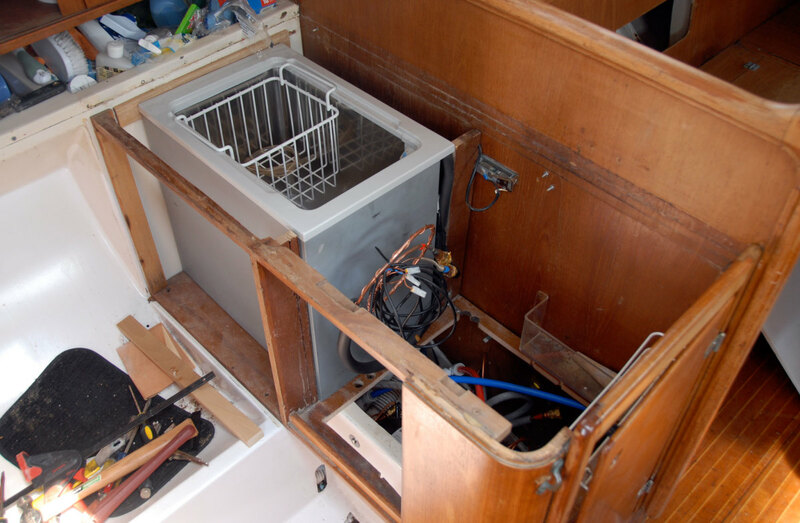 For the kind of use my fridge would get, Nigel strongly advised an evaporator over a holding plate, and told me the water cooling would be a boon should I ever take the boat into southern waters. 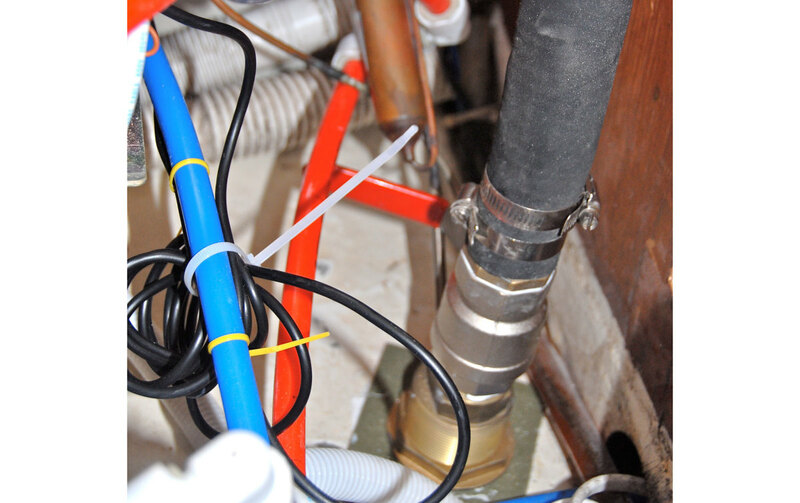 The SP system is basically a heat exchanger contained within a through-hull fitting, which meant I would have to remove the existing galley drain seacock and through-hull. Oh, and it would require a larger hole. 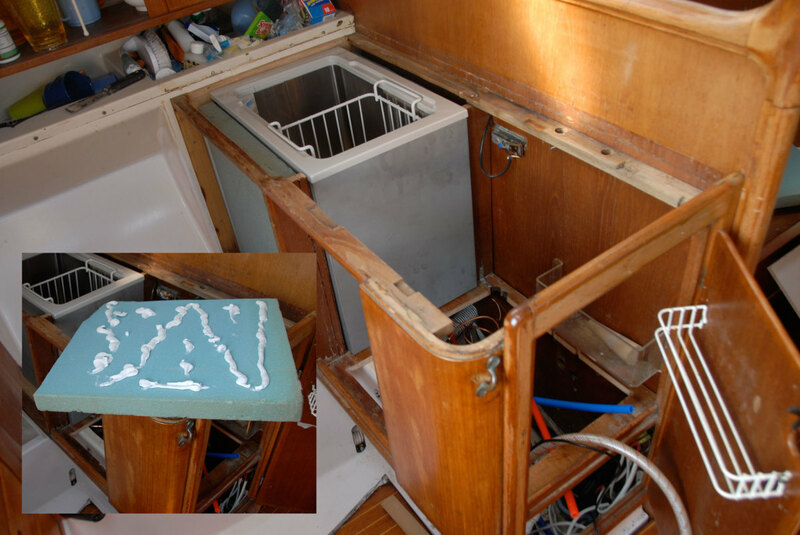 So the steps in the project would be: strip down the galley island and remove the old coolbox; install the new box and fix it in place; mount the compressor; remove the galley drain through-hull and seacock and replace it with the SP unit; hook up the tubing; connect the compressor to the power supply; replace the galley countertop, the sink and its plumbing. Easy, right? Actually it was, if a little more time-consuming than I’d bargained for.